Need a convenient way to digest the latest and greatest articles published in Wilderness & Environmental Medicine? Our podcast, Wilderness & Environmental Medicine Live!, features primary authors from some of the articles from our latest issue to walk you through their work and help you to understand what they found. 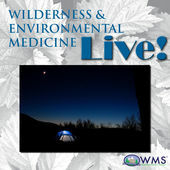 WMS members have seamless access to Wilderness & Environmental Medicine articles housed on wemjournal.org. Once logged in to the WMS website as a member, you can link directly to the Journal’s website by clicking on the blue "Member Journal Access" button above. Members will then be automatically directed to the Journal’s homepage, and will have full access to all content without having to supply a different username and password. Journal archives (or past issues) are freely accessible to members and visitors and do not require logging in. If a member directly accesses the Journal’s website (wemjournal.org) without first visiting the WMS website, he or she will not be verified as a WMS Member. Please use the "Member Journal Access" button above to gain access to member-only content. The Wilderness Medical Society invites submissions to our journal Wilderness & Environmental Medicine (WEM) from authors who want to take advantage of our established publication's unique scope, wide readership, and international recognition in the field of wilderness medicine. WEM is the quarterly medical journal of the Society - a peer-reviewed publication dedicated to wilderness medicine topics. In 2017, WEM began its 28th year. Its audience is a diverse group of medical and allied health professionals who choose WEM as their primary wilderness medical resource. WEM receives manuscripts from around the globe. Each is reviewed by a panel of the Journal's peer reviewers. The Editorial Board represents an international group of renowned experts whose focus is on the many aspects of wilderness medicine. With its full-text online access, WEM is even more accessible to its supportive readership and medical investigators. Author Instructions Here you will find descriptions on manuscript categories, how to format submissions, digital file requirements for figures, and a copyright release form that is required prior to publication. Please contact alicia@wms.org if you have questions. Wilderness & Environmental Medicine is published by Elsevier Publishing. Elsevier Editorial System (EES), our online submission and peer review program, makes WEM journal more efficient, accommodating, and accessible to authors and peer reviewers worldwide. We join many other scientific journals in becoming all electronic – submitted, reviewed, and edited in electronic formats. Online manuscript submission and peer review streamlines the editorial process and shortens publication time, making papers in both electronic format and hardcopy format available much more quickly to our worldwide readership. Beginning with WEM Vol. 18, No. 1, one (1) AMA PRA Category 1 Continuing Medical Education Credit is available to Wilderness Medical Society member physicians for each of the 3 predetermined CME articles per issue (a possible 12 CME credits per Volume - 3 credits per quarter). Beginning with WEM Live! Episode 1, .75 CME credits are available for listening to the podcast. To obtain your CME credit, login as a Member and use the CME link to the articles, follow the link to the online questions, answer the questions correctly, and a CME certificate will be presented at the end of the test that you can print. Objectives: After evaluating a specific article published in Wilderness & Environmental Medicine or viewing a specific lecture from the WMS Online Lecture Library, participants in the Wilderness Medical Society CME Program should be able to demonstrate an increase in, or affirmation of, their knowledge of wilderness medicine. Participants should be able to evaluate the appropriateness of the information as it applies to the provision of patient care or counseling. Participants: This program is designed for physicians caring for individuals with wilderness medical problems or counseling patients about avoiding wilderness-related health problems who wish to advance their knowledge of wilderness medicine. Credits: The Wilderness Medical Society is accredited by the ACCME to provide continuing medical education for physicians. The Wilderness Medical Society designates this educational activity for between 0.5 and 2.0 AMA PRA Category 1 Credits. Each physician should only claim credit commensurate with the extent of their participation in the activity. Disclaimer: The author of this article has signed a disclosure statement indicating that he/she has no relevant financial relationships with any commercial interest with respect to this course content.